Organic matter in soil is an important indicator of the quality of soil. In general, soil in Slovenia is well supplied with organic matter; this is evident from soil map data, which indicate that 86.2% of agricultural land contains more than 2% of organic matter, and 30.9% of land contains more than 4%. 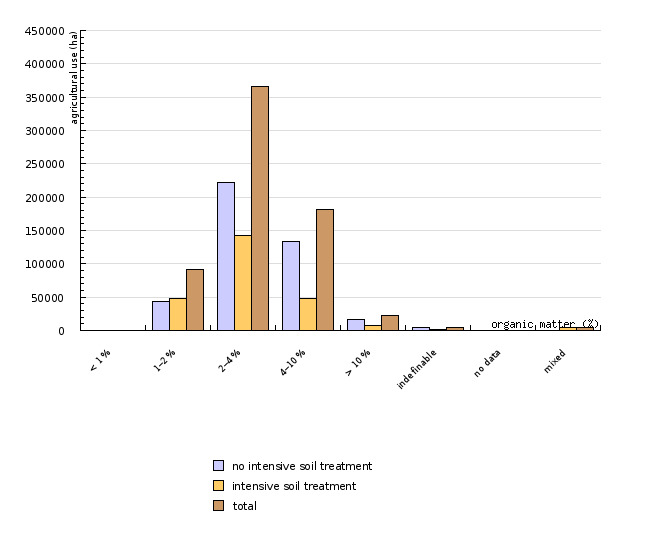 The results of laboratory analyses of soil samples taken in 2005 present a similar picture: 88.6% of samples contained more than 2% of organic matter and 37.3% of samples contained more than 4% or organic matter. This relatively good condition of soil is due to the fact that grassland is the prevailing element in the composition of agricultural land and that arable land and permanent crops are relatively abundantly fertilized with livestock manure. We established that in the areas with intensive land cultivation, the soil has a lower organic matter content than the soil on land that is not ploughed or deep ploughed. The reason for this is the more intensive rate of mineralization of organic matter on such land. The indicator indirectly illustrates the soil quality on agricultural land. It is defined as the ability of soil to perform the functions important for terrestrial ecosystems. These functions are primarily the production (food/biomass) and environmental functions (filtering and cleaning, recharging the groundwater, circulation of matter and energy, ability of CO2 sequestration, etc.). The quality of soil is not measured directly, it is defined by individual indicators. One of the most important indicators is soil organic matter content, which affects a number of qualities: it improves the aeration and porosity of soil, influences the fixation of nutrients and hazardous substances in soil, reduces erosion, offers a habitat for a number of organisms and acts as an atmospheric CO2 sink. Thus information on the quantity and type of organic matter is ranked among the most integral indicators of soil quality. Soil organic matter can be impacted by land cultivation, which causes faster mineralization and decline of the organic matter content. Systematic monitoring of organic matter represents a needed and an important task in the determination of a potential contribution of soil to the realisation of the Kyoto Protocol goals. Mineral soil with 1% to 10% of organic matter is considered quality soil from the aspect of agricultural production, as well. Organic soil (for example peat soil), however, has different qualities and a different structure and is treated in a different way. Ministry of Agriculture, Forestry and Food, 2001; Agricultural Institute of Slovenia, 2008. Environmentally friendly land use indirectly improves the quality of soil and its ability to perform environmental functions. In agriculture, this ensures land cover and prevents land degradation. Land use should have as little negative impact on soil and the environment as possible. The quality of soil can be further improved by reducing the release of hazardous substances into the ground. In accordance with the Resolution on National Environmental Action Plan 2005–2012, the goal is to establish national monitoring of land by 2006 and conclude the review of land pollution by 2008. The goals concerning soil quality are of a descriptive nature, while quantitative goals are not defined. Based on the analyses of soil profiles, the soil map and types of soil according to different agricultural land use in Slovenia, it was confirmed that the upper soil horizon on land with intensive soil treatment (arable land, hop fields, vineyards, etc.) contains less organic matter than the land which is not ploughed or deep ploughed (meadows, extensive orchards, etc.). In general, the soil is well supplied with organic matter; this is evident from soil map data, which indicate that 86.2% of agricultural land contains more than 2% of organic matter, and 30.9% of land contains more than 4%. The results of laboratory analyses of soil samples taken in 2005 for the purpose of soil fertility monitoring present a similar picture: 88.6% of samples contained more than 2% of organic matter and 37.3% of samples contained more than 4% or organic matter. This relatively good condition of soil is due to the fact that grassland is the prevailing element in the composition of agricultural land and that arable land, gardens and permanent crops are relatively abundantly fertilized with livestock manure. More detailed and long-term monitoring of soil quality indicators would provide a more accurate picture of the condition and quality of the soil and their trends. There is no systematic data collection on organic matter in soil in Slovenia. In the scope of soil fertility monitoring, the analysis of organic matter is not a standard soil parameter determined routinely. We estimate that organic matter is analysed in less than 10% of soil samples. The data acquired is not spatially defined and thus cannot be used in spatial analysis to assess the soil quality. –Agricultural Land Use (LU95), Ministry of Agriculture, Forestry and Food, 1995. • agricultural land use with no intensive soil treatment (Z) (1222 – extensive orchards; 1230 olive plantations; 1310 intensive meadows; 1321– bog meadows; 1322 – extensive meadows; 1410 – afforestation areas; 1420 forest tree nurseries; 1500 – mixed land use). 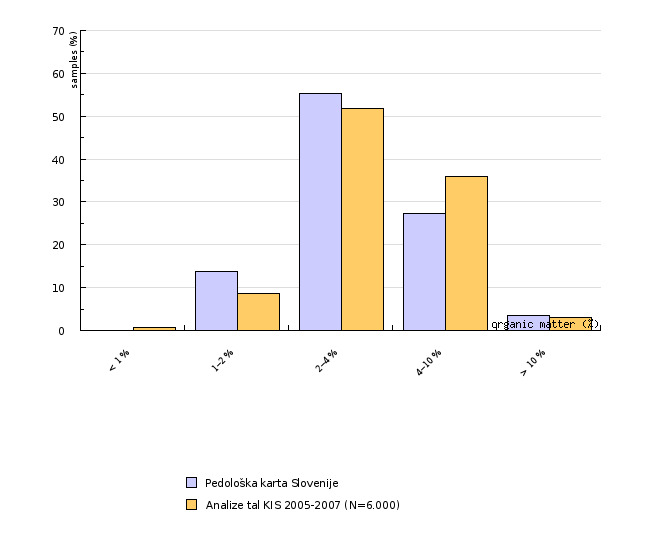 The second analysis was performed by means of laboratory data on organic matter in 1,948 soil samples systematically taken from the entire territory of Slovenia in 2005 (AIS, 2005) from a depth of 0-6 cm in meadows and 0-20 cm on arable land and permanent crops. The data for the table "Distribution of soil organic matter for the data acquired from the soil map(SM 1:25.000), and for the laboratory analyses data in 2005” (AIS, 2005) were calculated for the land with a known organic matter content in the soil, i.e. for 98.6% of all land. The data from the land where organic matter was impossible to establish and data from the land where the organic matter content varied significantly were not considered.